(Edit) - This is what my finished set-up looks like - LOVE it! The rocks are in bucket to the left. 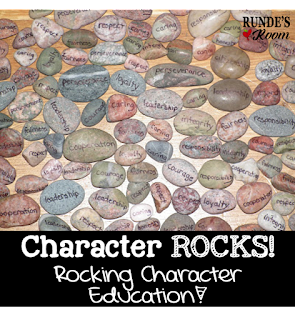 When a student nominates another student for a "character rock", they fill out the card (in the basket in the middle), glue the rock with a fitting character trait to the basket (they can use the glue gun by themselves, or ask me for help) and drop the finished rock and card into the bucket to the right (bucket-filling). :) At the end of the week I go through the bucket and hand out the rocks. And that way I have time throughout the week to monitor who is getting nominated for stones, and if there is a student who hasn't received one in a bit, I can drop one in the bucket). If you're interested in trying this system yourself, I have a post HERE with a link to everything I have included on the bulletin board. Thanks for a great idea, Barbara - your helpfulness filled my bucket! I love this idea! 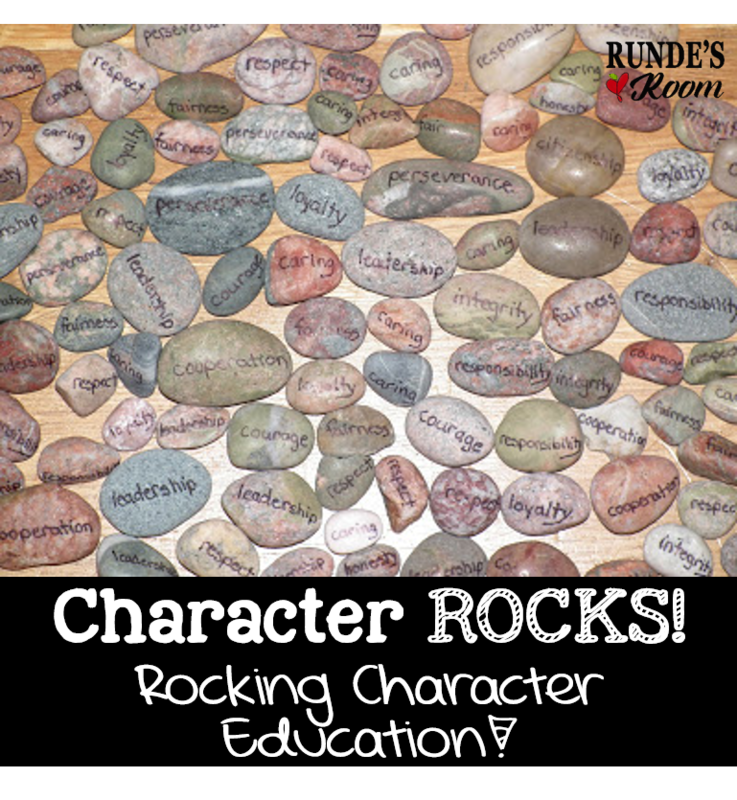 Our third grade studies rocks so I could see many uses, but I love the Character Education Idea! What an adorable idea! I can't believe that you wrote on all of those rocks, that shows true dedication to your project. I think that your students will really enjoy this. You will be able to reinforce character education and classroom community at the same time. Plus, who doesn't love a free idea! Just out of curiosity, do you have a plan to monitor who receives rocks? So that the same students don't always get all of the rocks or the same students are not continuously left out. Thanks, ladies! 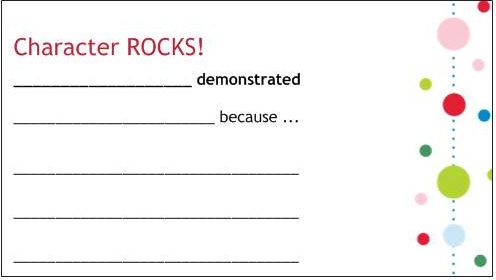 Mrs. Corbitt - I will monitor who receives rocks (probably keep track on a class list), and I will be filling out the cards as well, so I can make sure all students receive some. OMG - if these aren't just the CUTEST things I've ever seen!!! I've always had to buy my river rocks but these authentic little gems ROCK!!! YAY. You totally made my day. For those of you who'd like other character-education infusion ideas, here's the link to the pages that I maintain my my school site with tons of engaging activities and lesson plans for your character building. I'm not really set up with buttons and bling to host a link party, but this idea would make a GREAT launch to What is your favorite character-building idea? Barbara - that's a GREAT idea for a linky party - I think I'll set something up very soon. Ms. Jasztal - Thank-you very much, and WELCOME!!! I hope you find more useful ideas! I hope you don't mind but I loved your idea so much that I borrowed it for my room this year. Thank you so much for sharing this idea! Deb - I don't mind one little bit! I was given the idea from one of my followers and I thought it was fantastic. 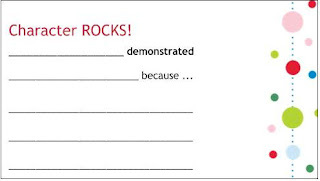 We've been using "You got caught" slips so that students could catch other students doing good things. We discontinued it for awhile because the slips were starting to become "So-and-so is a good friend." We couldn't get them off the "to be" verbs. These slips with specific character traits are the tweak we need to make it work. Thanks!